Welcome to Part 3 of the Virtual Quilting Bee! Today we’re going to discuss quilting tips and techniques as we prepare to sew our blocks. Next Friday will be our first quilt block tutorial designed by Sherri of A Quilting Life. Sherri is such a talented and experienced quilter – I can’t wait to see what she has up her sleeve! Today I will share some quilting tips and basic techniques. As I’ve mentioned previously, if I have written more indepth about these topics, I will link to those posts, rather than re-hash everything again, but hopefully this will be a good reference point for lots of different quilting basics. · Read all the way through the entire pattern before you do anything. It’s always good to get an idea of the ‘big picture’ before you start. · Check the experience level so you don’t get frustrated. Complex quilting takes practice. I would suggest starting with something simple at first – larger shapes, simple design, etc. just to get the hang of things before jumping into something more advanced. But that’s just me. To pre-wash or not to pre-wash? Growing up my mom pre-washed everything, but once I started working in a quilt shop about 9 years ago, we never pre-washed and didn’t worry because we were always using high-quality fabrics. There were a few occasions where something bled after everything was pieced, but those were very, very few and far between. Occasionally I’ll wash a solid red or black, or something from a manufacturer that I don’t trust, but that’s very rare. I wrote more here about my Pre-Washing experiences and Shout color catchers. But basically, if you’re using new, high-quality quilt-shop fabrics you don’t need to pre-wash. I actually prefer working with the fabric right off the bolt because it has the sizing still in it and it’s easier to cut accurately. Also, you do not need to pre-wash pre-cuts. Besides being a huge pain in the rear to re-shape and press, they are likely going to fray and you’re going to loose a lot of fabric real estate when they shrink slightly. Accurate and careful cutting can save so much frustration down the road, not to mention wasted fabric. Take the time to cut your pieces accurately. Here are a few tips, but for more detailed information and pictures, refer to the Cutting 101 post as part of the Beginning Quilting Series. · Respect the rotary cutter. A good quality rotary cutter will make a big difference in your cutting. (I use Olfas.) Change the blade – don’t try to milk that blade to death, you’ll only get frustrated. I’m always amazed at the difference a new blade makes, and I always wonder why I waited so long to change it. (Watch for coupons and sales on blades so that you can buy them in bulk for a better price.) Also, be careful. Those suckers can draw some serious blood if you’re not careful. · Cutting multiple layers of fabric at a time is a great time saver, however I try not to cut more than 4 layers at once. The larger the blade, the more accurately it will cut through multiple layers. I generally use my medium-sized Olfa blade (pictured) for most projects, but I have a large blade that I LOVE for cutting lots of pieces at once. Use the mini blades for small projects like trimming or squaring up blocks. 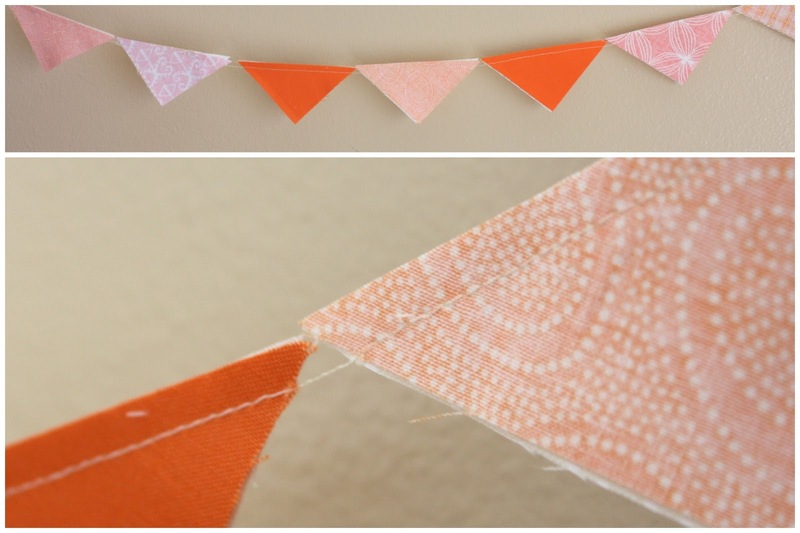 · Square up your fabric before you start cutting strips or pieces. It takes a minute more of your time, but makes a huge difference – especially when cutting pieces like long strips. Start by matching up your selvage edges – that may require re-pressing the center fold – so that you can use the straight edge of the selvage as a guide for squaring off the raw ends. (A lot more in depth explanation and photos found in the Cutting 101 post). · Use the ruler – not the grid on the cutting mat – as your guide for cutting. The ruler is going to be more accurate, especially when cutting small pieces. · When cutting strips, pieces, etc., place ruler over the top of fabric at the desired width/size your need to cut. You can use multiple rulers if you need more width, etc. Piecing is the actual sewing the pieces of the block or quilt together. Go here for the Piecing post of the Beginning Quilting series. · The key is a consistent ¼” seam allowance! Always keep the edges of your fabrics matched-up and against the edge of your presser-foot as you sew. It will feel tedious at first, but the more you do it, the more natural it will feel. · A SCANT ¼” seam allowance is best. Measure your seam allowance with your ruler. Your seam should fall just inside the ¼” line of your ruler. 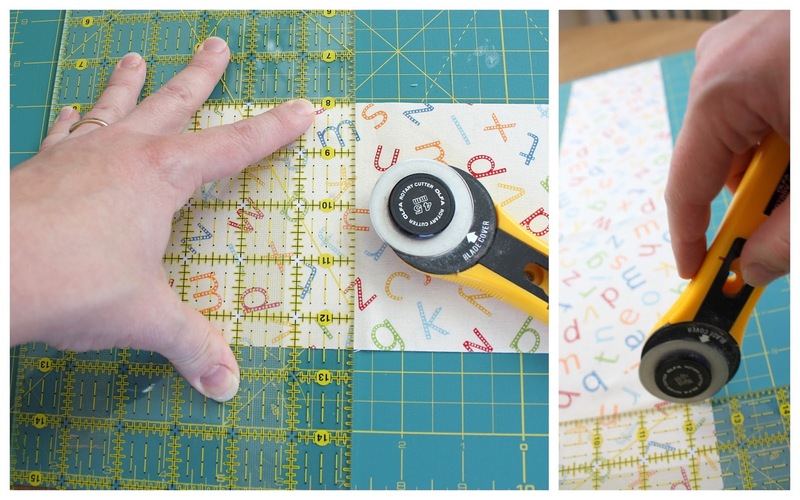 This will help so much with accuracy with creating your quilt blocks. Your piecing will just fit together better. Many machines have a ¼” presser foot available. I just adjust my needle to the right one notch and it’s perfect with my regular foot. Go here for more details on and pictures of a Scant ¼”. I can’t emphasize this one enough – especially as we plan to make quilt blocks for this quilt along. · Chain piecing is a great method when you are sewing lots of little pieces together at once. Just feed them through the machine one right after the other without breaking the thread or raising the presser foot. Then trim between the pieces when you’re ready to sew the next step. Saves time and thread. I will sometimes take the whole chain to the ironing board and press them open before I clip the threads. Please note there is a difference between pressing and ironing. You definitely don’t want to iron your quilt piecing or blocks as it could stretch and misshape the fabric, but pressing makes a huge difference in a neat, crisp-looking block or quilt. Pressing is more careful and gentle, but using a lot of heat and sometimes some steam is a great asset. · I press seams to the side, unless it is a heavily pieced block where the seams create a lot of bulk, then I will occasionally press my seams open. Sometimes patterns give pressing directions, sometimes I just do my best to guess. · “Set the seam” –- this means to press over the seam first with seam still closed. I don’t know the science of “why” behind “setting the seam” but it really does make a difference. · Then open up blocks and press again from the top (front) to get a nice clean press. This way you can also make sure the seam is open all the way and nice and flat. · To steam or not to steam? I don’t always steam, just because I don’t like to keep water in my iron. (leaks, wrecks the iron after a while, etc.) but it’s an option if you have really small pieces and/or need something to lie really flat. Just be careful not to stretch or distort the fabric. Squaring up your quilt blocks means to measure and trim them so that they measure accurately and are all the same size. I get it – squaring-up can be tedious work- but it makes a HUGE difference in keeping things accurate and square. I like to piece my block portions like flying geese, half-square triangles, etc slightly large just so I have the room to square them up with nice, straight edges. Just make sure that you square up evenly on all sides. Those square rulers with the diagonal line are a big help for squaring up because you can use that line to find the diagonal center of the unit and keep the block from getting trimmed in-accurately. For squaring up something with a point, like this flying-geese block, make sure you leave a 1/4″ seam allowance at the tip of the point. A Pineapple or Flying-geese ruler like this one will have a guide to help you maintain that 1/4″ at the point. Also note how I squared up evenly on all four sides so that the point remained centered. Finally- remember this is all about having FUN. Cutting and sewing accurately will minimize frustration down the road, so they are definitely worth practicing, but at the same time, don’t be obsessive about perfection. It can take all the fun right out of the experience. It’s not a race or a competition and there is no Quilting Gestapo that are going to come check every seam allowance or measure every quilt block or make sure you’ve followed the pattern perfectly. I’ve learned not to fret too much if a few star points get lost along the way while I’m doing something creative. Then again, I don’t usually enter any of my quilts in the State Fair – for the most part they’re for me or for friends and family who generally don’t quilt. For me quilting is about playing with color and design and a creative outlet. Your purpose might be different than mine – just do what makes it a fun, creative experience for you. Play with different colors, don’t be afraid to stretch yourself a little, but make sure it’s still something you are enjoying along the way. I have set up a Virtual Quilting Bee Flickr group. There’s not much to see right now, but as we start having blocks to share, please feel free to upload your creations. One of my favorite parts of going to a quilting class is to see the variety of fabric choices people bring to the same project. It’s so inspiring! This Flickr group will be like our ‘classroom design wall’. Thanks so much for participating. I really want this group to be as helpful as possible! Feel free to leave tips or links to other quilting techniques in the comments below. Also, if you have questions, I will leave my responses in the comments as well. Yay! I can&#39;t wait for next Friday! Today&#39;s info. Was very helpful! That was an AWESOME post! Very thorough 🙂 You ROCK!!! Amy, thank you so much for all the information that you provide. I cant wait to start this next friday! Because this will be my first quilt Im expecting lots of mistakes but I&#39;m so encouraged after your &quot;pep talk&quot; about having fun and not putting too much pressure on ourselves. Thank you 🙂 Have a great weekend!!! That is so great! Thanks for sharing it Jessica – and how awesome to have friends that want to learn to quilt! You are so talented Amy!! I can&#39;t wait to get started!! Thanks for your experience and gift of teaching. Fantastic post and such great information. One talented woman aren&#39;t you Amy. Love it!! Have you ever thought of putting your tutorial into book or printable form for easy reference? They are great for the beginner – like me. I have just started the Tripping Around the World using Sherri&#39;s tutorial. It works really well, although I have only made one block!!! Amy, I am so excited for this Virtual Quilting Bee! Thank you so much for putting this on. May I ask a question? I have been quilting for about a year and a half and I still have a terrible time with Flying Geese and Half Square Triangles. I was very interested in your flying geese picture above and the two rulers you wrote about. Is there any chance you will be &quot;demonstrating&quot; those? Cathy,<br /><br />Great question. I don&#39;t know yet what the 16 blocks will look like, but I think that is a great idea for a post. I&#39;ll try to do one along the way somewhere about Flying Geese and Half Square Triangles – those are such useful basics. You spoke my reasons for why i quilt too. I love playing with fabric, arranging colours and seeing how small beautiful parts make up a large beautiful thing. And, everyone needs a hobby, I agree. These have been great posts! Thanks for the information!! Thanks for these posts. I have forwarded to a couple friends that are thinking of trying their hand at quilting. Wish I had seen these when I started. What a great post thank you for taking the time to write it. thank you for sharing your philosophy, it&#39;s exactly how I feel. Right now my first sampler quilt is spread out in the living room and loaded with toys–it&#39;s a train. And that seems exactly right to me. My quilts are for living with. I did a fabric pull and am looking forward to the first block. Thanks so much for all of the sweet comments everyone! I&#39;m glad this series has been helpful or motivational in someway. I&#39;m excited to see the blocks that we make next! Hi, just found this site, and it&#39;s wonderful! I&#39;m fairly new at this wonderful craft, and have been doing different things to find my niche, wall hangings, totes, small baby quilts, and now I&#39;m on my second rag quilt. The first was small, all flannel, but my present project (biggest one so far!) is a queen size jean/flannel rag… oh my gosh… lots of pieces to keep track of! Gostei muito desta aula. &quot; Sim , foi uma aula realmente.&quot; Agora já me sinto muito mais segura para prosseguir com meus projetos ( ainda são muito simples) .Acho que estou no caminho certo.<br />Muito obrigada por sua generosidade em compartilhar tudo isso.